Satellite photo of the San Diego California Temple with the “Seal of Melchizedek” overlayed 13 times. I particularly like the symbol used in the skylight of the atrium in the center of the temple. To continue my research I wanted to know as accurately as possible the story about this symbol, the “seal of Melchizedek,” as it was used in the San Diego Temple. I couldn’t find a good account online, so I decided to go to the source. Who better would know than the design architect of the temple? So I gave him a call. His name is William “Bill” S. Lewis Jr., and he is a member of the Church and a current sealer at the San Diego Temple. He graduated from the University of Southern California in 1953 with a degree in architecture, was a co-owner of an architectural firm in San Diego for a number of years, and he has been involved with many architectural projects in the San Diego area. I’m sure he counts his design work on the temple as one of his most cherished experiences. He retired in 1990, after a 41-year career. See the footnotes for a little more background about Br. Lewis 1. He was very cordial on the phone, and gave me the courtesy of about a twenty minute phone call. The story he told me was intriguing, and I thought it would be good to document it. He said that the architects were given quite a lot of freedom on the design of this particular temple, and it was not dictated by the Church’s building department as other temples have been. This freedom was granted expressly by President Hinckley. He said they were working hard to find a common symbol, module, or pattern to give continuity to the design, or to give a certain character to the temple. They started with a square, but they thought that was too plain and boxy. Then they started chamfering the square’s corners which brought it to an 8-sided figure. When they extended the lines it became two overlapping squares. They thought that would work well and so they started using it more and more in the design of the temple. He said that the more they used it the better and better it worked. Some people asked about the symbolism of the design, and he told them he didn’t know if it had any particular symbolism. He said that they put a circle in the middle, which he thought could have stood for the sun or the Celestial Kingdom. 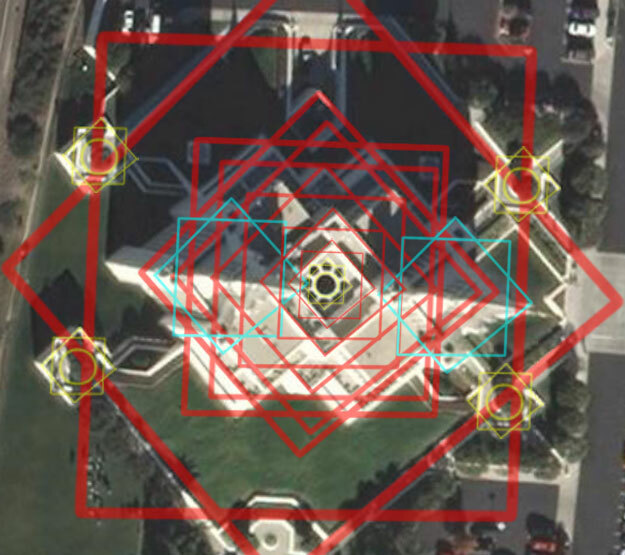 He said that they used it many thousands of times all throughout the design of the temple – in the doors, fencing, exterior, interior, trimwork, floorplan, etc (see satellite photo above for the use of the symbol in the overall layout). When the design was originally shown to the General Authorities in Salt Lake they had sun stones, moon stones, and star stones on the exterior of the temple too (mirroring the Salt Lake and Nauvoo Temples), but the Brethren notified them that these symbols shouldn’t be used. So they removed these symbols, but they didn’t say anything about the interlocking squares symbol. Once the temple was finished, Elder David B. Haight of the Quorum of the Twelve Apostles escorted the media through the temple, as they are some of the first that get to go through. Someone from the media asked him what the symbol was, and what it represented, and Elder Haight was taken a little off-guard by that question. He said that it was probably just an architectural detail. Br. Lewis said that a good friend of his, Stan Smith, who has been a regional representative, and was the project representative on the temple, was taking photos all the time during the construction of the temple. But this particular symbol bugged him for some reason. He took the photos he had down to the Church Historian’s Office in Salt Lake City and asked if they knew anything about it. They didn’t. But they suggested that he take them down to Hugh Nibley at BYU who might know something about it. So Br. Smith made an appointment with Br. Nibley, and sat down with him in his office and asked him if this symbol had a name. Nibley said something like, “Oh sure, it is the seal of King Melchizedek.” He also indicated that it was a symbol of Melchizedek’s power, kingdom, and as a type of name of Melchizedek, like a seal in wax. Stan Smith called Br. Lewis to tell him the good news, and was quite excited about it. Br. Lewis wanted to verify it himself, so he made an appointment with Nibley too. Nibley verified it with Lewis as well, after which they had an extensive conversation about all things temples, Greek, Roman, Egyptian, etc., with Nibley in typical fashion referring to all three in the same sentence. Br. Lewis said that President Hinckley would probably be interested to know this detail about the symbol, since he had met with the architects 4 times throughout the design of this temple, which was extremely unusual. So Lewis wrote a letter to President Hinckley, who Lewis said also verified it with Nibley. Since then Br. Lewis has seen the same symbol used on the Newport Beach Temple, and also in several places in the Salt Lake Temple (like the door patrons enter with a beehive in the center), and he supposes that we will see it more and more as time goes on. But he was pleasantly surprised to have found out such an interesting detail about the symbol that he used throughout the San Diego Temple. He has been asked to speak hundreds of times about the design of the San Diego Temple in firesides and other occasions. He said a couple years ago he was asked to speak at an event of the Fine Arts Department at BYU about it, but wasn’t sure of the details of the occasion. It is doubtful that there is a transcription anywhere of this story, so I took as many details down as I could on our phone conversation. Thanks to Br. Lewis for telling us this great story. Your post is very interesting. I have seen the 8 pointed star used in different designs for buildings, non-LDS. It is a common symbol used in Islam, and is used to reflect Islam in the floor plan of the Petronas Towers in Malaysia. Great series of articles, and thanks for getting the actual story from the actual architect. The San Diego temple is my favorite, and not just because it’s in my home town and I watched it get built (and helped to pay for it). The SOM motif really is everwhere; if you ever visit the temple, look closely at the elevators (which are octagonal rather than rectangular). ..bruce.. Wonderful story, and thank you for documenting it. Sometimes there is revelation and we don’t even know it is. I love Nibley’s instant response: “Oh, sure … .” This reminds me of a personal story I have about him that I need to post on my blog . Although my story is NOT as inspiring, it is funnier. Thank you all for your comments. I have seen the webpage you reference Chad, and it is a very good reference about the symbolism of the eight-pointed star. I’ve visited the San Diego temple before, but just saw the exterior, and I had no clue at the time about this symbol. Now I want to go back. This is fascinating! Thank you for sharing your interview. It is cool how the design ended up being inspired, as the team did not know about the symbolic significance until afterwards. Thanks for the inside scoop! It’s so interesting when a different approach is taken–and for no apparent reason–like for the design of the SD temple. Now, perhaps this isn’t the proper venue for this tangent (although I prefer to think of it as a ‘secant’ ;), but I’ve been curious why the use of symbolism on Church edifices has fallen out of favor, or acknowledging that symbolism is present, and not just regarding temples. I know that the tour guides of the Conference Center are to no longer discuss religious symbolism present on at least the roof, although they discuss general symbolism of it. This post serves as a reminder that I need to stay-up on my RSS feeds. Awesome story! Thanks for sharing. This is just so awesome!! Bryce, thank you for the wonderful info and for this fascinating topic. Iif you have a moment please look here (using Google): piecesfrommyheart.net (“pieces from my heart.net” online quilting store from artist Sandy Gervais.) Then enter the term, “pattern 337 Illusions”. -Click on picture to enlarge…i ran across this pattern at a quilting store in Lehi, Utah, yesterday. I was more than surprised to see the Seal of Melchezidek, along with the interlaced trianges and another symbol. There is not a better photo of the pattern available, i even opened it to look inside. The author/artist doesn’t allude to any symbolism other than “illusions”. Thank you! and thank you for sharing the great and inspiriting information. You’re welcome Marise. That is interesting. Here is a direct link to the photo – link. I read this series of articles this morning, and then spent the day with my mother – at the San Antonio Temple! I told the story to her, and we both had great fun finding this symbol on the carpet, on the altar, in the tile, and even a modified version in the beams! Thanks for the fantastic insight! Great Story. I also found this symbol in the albuqueque nm temple. A couple of things to add, this star in hinduism is called the star of Lakshmi and in Islam it’s called Rub el Hizb. The Islamic meaning is the closest I think to Melchizedek or the Melchizedek Priesthood. Thought you might be interested in knowing that this symbol is used in the design of the chandeliers in the celestial and sealing rooms of the new Oquirrh Mountain Temple in the Salt Lake Valley. Thank you so much for the research. I love studying anything about symbolism, but especially temple symbolism. It is sad that as time goes on there is less and less symbolic meaning in our society. As Alonzo Gaskill put it in his title of his book, as a society we are symbolically blind (The Lost Language of Symbolism). A friend pointed out to me that the seal of Melchizedek is in the Oqurrh Mountain, Utah temple too. I looked at the chandelier of the sealing room and thought it was a cool design that looked like a star of some sort, but then went home and talked to a very well read friend of mine that pointed out it was the seal of Melchizedek and gave me your links to read. It is fitting that the seal of Melchizedek would represent his name since the star of David could also represent the name of Solomon or seal of Solomon. Truman G. Madsen wrote an article title “Putting on the Names” that everyone who is endowed has to read. What interests me is that so many apparently thought it was nothing more than an architectural design. I was at the San Diego temple for the first time in my life last week, and the instant I saw it, I thought it was clear what it meant. The number eight symbolically refers to rebirth, resurrection, baptism, new beginnings, etc. It is often viewed as the “number for Christ” and pops up quite frequently throughout the scriptures. For example: 8 people survived the Flood, Christ rose on the eighth day of the week, children are baptized at age 8, circumcision is performed on the eighth day after birth, the Jaredites built eight boats, and so on. When I saw the star, the symbolism of Christ, rebirth, new life, and so on instantly came to my mind. As I sat in a sealing room watching the sealing of a friend, it was overwhelming to see the 8-pointed star reflected in the carpet, the walls, the ceiling, even the shape of the room. Here was a man of God receiving the highest ordinance in, through, and because of Christ. The symbolism was truly amazing. I hope I can go back again soon! Bryce, another great post (as always). I was sealed by Brother Lewis in the San Diego temple in 2000 and he’d mentioned to us that he’d originally seen the seal of Melchizedek shape in a dream. The dream repeated itself several times, and finally he got the “courage” to bring it to the attention of the other architects. One of our witnesses was also a San Diego temple architect and he confirmed this as well as all that you posted above. This temple is definitely my favorite – it seems they didn’t even waste an inch without some sort of symbolism and meaning. Thanks for bringing out its wonderful symbolism. Thanks, Jennifer, for backing me up on the specific detail of the dream. I remember these details from a fireside in San Diego. Two of the three-member architect team are LDS, one is not. I wonder why Br. Lewis has not recounted the source of the inspiration in subsequent tellings, but I only know what I heard and saw at the fireside. The wonderful thing is the knowledge of Hugh Nibley that helped bring truth of the symbol’s meaning to light! P.S. Oh, by the way, the palace of Saddams at Camp Victory in Iraq, when viewed from the air, is strangely similar to the layout of the San Diego Temple. As are many of the mosques and call towers throughout the middle east. So when do we get the final part(s) of this article series Bryce? The star/seal of Melchizedek has fascinated me ever since I first attended the San Diego Temple. I’m really curious what else you have for us (such as the correlation between it and the star of David that you mentioned). Hi Tevya. I do have more to say about it, but don’t know when I’ll get to it. I have some other things that I’m currently attending to. We’ll see how things go. I kinda figured that from your updates and such. I feel ya. Just thought I’d offer a little encouragement and support, so you’ll be motivated to do it whenever you can get to it. Did you also know that this symbol was the basis for an isotruss that could very well change the engineering world. It is used three dimensionally to form one of the very strongest trusses known. Discovered by a professor at BYU. Just one more witness of the flood of light being poured out in the last days. My husband and I were also sealed in the San Diego Temple in April 2000. Our sealer was Br. Bryant Rassiter. He too mentioned to us on our sealing day that the symbol we saw throughout the temple was the “Star of Melchizedek”. I had never heard of this before that day, but it always stuck with me. I was pleased to find this blog – I was reflecting about what the Sealer told us that day and I even looked at my wedding album to find again the star symbol on the temple. I wanted to see if anyone else was ever told this, and now I found this whole wealth of information. I look forward to seeing more posts on this subject as you get time. Thank you. I was looking at the picture above of the overhead view of the San Diego temple and counted and in that picture there are 12 stars or seals of melchizedek. That’s interesting because the number 12 symbolizes the priesthood, the temple is governed by the priesthood, particularly the Melchizedek Priesthood. I was reading your comment on the New Jerusalem, very interesting. A few comments though: the book of Revelation is talking about John’s experience in the temple in heaven or the Celestial Kingdom, not the New Jerusalem (Rev 21:16). The New Jerusalem will be established during the Millennium, when the earth is a Terrestrial sphere, not when it is Celestialized. I liked your comments, whose material are you reading about the New Jerusalem? celestialized earth becomes a giant diamond if you will at the end or a giant crystal and that down to the molecular it is a cube with in a cube. Thus the seal of melchizedec is in fact the 2 dimensional representation of the celestialized earth or our eventual heaven. The geometry found likewise within the endowment speaks of this as well. Take all you are taught in the endowment and put it together and you will find it forms a cube. Soloman’s holy of holies was a cube ect. These things are far from accidental or coincidence. It is all one eternal round. In answer to your question about my personal readings these are all personal in sights given to me and not found from any thing that I read. Thanks for you comments again. On this diamond planet tangent, I thought you’d all like to know that Lucy Mack Smith, upon seeing the urim and thummim described them as the following: “On the morning of September 22, after Joseph had returned from the hill, he placed the article [the Nephite interpreters] of which he spoke into my hands, and, upon examination, I found that it consisted of two smooth three-cornered diamonds set in glass…” (The Urim and Thummim: A Means of Revelation in Ancient Israel. By Cornelis Van Dam). Being as the Earth will be come a great urm and thummim, this diamond theory is in fact very probable. It’s title is “Diamond Star Thrills Astronomers”. So we know that it is physically possible for a huge diamond to exist. I thought this was cool stuff….food for thought. God works in mysterious ways. Please give us more. We are waiting patiently for you. I will get there eventually. I’m putting my house in order, first and foremost. I wish I could spend all day every day studying and writing about the temple. Unfortunately we live in a capitalist economy. No worries. I completely understand. Home and family take priority. You bringing up capitalism is interesting though, only because I’ve been reading Nibley’s Approaching Zion. Ouch! Talk about a call to repentance. I really want to delve into consecration and United Order. Approaching Zion is one of my favorite books. Life changing. We certainly won’t have capitalism in the millennium. Andrew thanks for your referencing the Kaaba. The word literally means cube and according to tradition represent the “House in Heaven. It was originally built by Adam as a representation of our heavenlly home and later rebuilt by Abraham and Ishmael. Once again heaven being refered to as a cube as presented by John the revelator. If you go to the Parlament in London you will see the seal of Melchizedec in the floor of the great hall as well and the octaganal room it is placed in. I would also encourage you to google the “Temple of Heaven” in Bejing China. You will find that the giant complex is a circular temple sitting on 3 plateforms which is placed on a square larger platform. The Chinese for centuries offered blood sacrifice here as the original religion of China know as the ” Worship of the God of Heaven”. The square represents earth while the 3 tiered platform and 3 roofed temple on top represent heaven. Or literally heaven on earth. The decendents of Noah were taught the truths as they covered the earth and remnents can still be seen. Very interesting blog. I really enjoyed this series. I grew up seeing the diagrams and designs for the San Diego temple, whenever I played at my friend’s house (Bill Lewis’ daughter). As a child I couldn’t imagine someone being interested in or working on any one project for so long. It was inspiring. It is interesting to hear the differing versions of how the interlocking square motif came to the San Diego temple. Thanks! I finally got around to posting the next “Part 5” of this series on the seal of Melchizedek. Enjoy! I’m the grand daughter of Bill Lewis, and although this story as morphed into many versions on the internet over the years… your accounting is accurate from your conversation with my grand father. Thank you for taking the time to talk to my grand father and share this story. I’ve been begging him for years to write a book about the 8 year process of the building of the San Diego Temple. Thanks again!